It is the US that is leading from behind the Saudi and other Gulf Cooperative Council countries’ war against Yemen. The GCC front countries for the US are the Kingdom of Saudi Arabia (KSA), United Arab Emirates (UAE), Bahrain, Kuwait, and Qatar. On October 31st the US Secretary of Defense James N. Mattis and the US Secretary of State Michael R. Pompeo called for a cease fire and a negotiated settlement to the war against Yemen. This was more than an obvious publicity stunt. Was it a cruel Halloween prank? Making sense of the devil: The US has so many resources in all areas of politico-military influence (including hybrid power, i.e., various forms of propaganda), that it can easily confuse the innocent bystander. Enjoying a master architecture of hypocrisy, the US can often try to have it both ways. For example, this video of a Saudi atrocity is being documented and distributed by the VOA, a US government agency! The Devil selling crosses, as they say. The United Nations [its mission and inpartiality weakened and hollowed out by decades of attacks and manipulation by the United States and its accomplices] is now just a US lapdog that gives the US and Saudi coalition a fig leaf of legality for the genocide in Yemen. The UN has authorized a one-sided arms embargo against Yemen, which the US and Saudis have turned into a total blockade of food, water, and humanitarian supplies. The blockade is keeping vital supplies from the Yemeni civilians, which are desperately needed by them to sustain life. The real Halloween boogeyman who is killing hundreds of thousands of Yemenis is the US-backed Saudi boogeyman Mohammed bin Salman. He is known affectionately as MBS, by his drooling admirer Thomas Friedman of the New York Times. MBS is a blood drenched madman. He chops off the heads of his critics, dismembers their bodies with bone saws, stones women for adultery, and crucifies victims just for the fun of it. The US turns a blind eye from this bloody madman, because he buys billions of dollars’ worth of US weapons. Then MBS uses the US weapons to kill innocent civilians in Yemen. Friedman says MBS is a liberal reformer in Saudi Arabia because MBS lets women drive cars (as long as they get their husband’s permission first). There would be no war against Yemen had the US-led Saudi coalition not first attacked that country from the air, land and sea. Tens of thousands of people, most of them children would not have died, there would not be the worst cholera epidemic in history and 20 million people would not be suffering from a man-made famine, had the US-backed Saudis not invaded Yemen. It was the Obama administration that gave the Saudis the nod, wink and the military support for its war of aggression against Yemen. Yemen had not attacked or threatened anybody. It was the US-led Saudi coalition that started the war in 2015. It was code named Operation Decisive Storm. Like most US-backed wars it was not decisive. Operation Decisive Storm was supposed to be a short war, a cakewalk as the military likes to say. As we have seen in Afghanistan, Iraq and Syria, these cakewalks turn into never-ending wars that turn into quagmires, they kill hundreds of thousands of people and they leave millions of people in dire distress. Three years later in 2018, the US-led coalition is still bombing, blockading, starving civilians and purposely causing the spread of the worst cholera epidemic in history. It is another US dirty war similar to the wars in Afghanistan, Iraq, Libya and Syria. As with the US-imposed blockade of Iraq in the 1990’s, a million children will die of cholera because of the destruction of the water purification works and the blockade of replacement parts and potable water. Mattis’s and Pompeo’s Halloween announcement made it clear that they were not serious. Their announcements were just a Halloween prank to try to garner some good publicity after the tarnishing the US took from MBS’s butchering of Jamal Khashoggi in the Saudi consulate in Turkey. That murder, which is not out of character for MBS, just happened to present a temporary public relations problem for the US, as well as for the Saudis. The ugly publicity against MBS spewed over onto the US. The US came under scathing criticism from the US public for being allied with the Saudi gangster regime. The US-Saudi relationship has cast a bright light on the true nature of American values. They are denominated in power and dollars. Mattis’s and Pompeo’s Halloween prank was an attempt to try and distance the US in the public’s mind from Saudi Arabia. They were not making a sincere peace initiative. It was all about political jockeying, hoping that the ugly Khashoggi murder would blow over. Anybody that has been following US foreign wars knows that the US and the Saudis are together in them. They both have blood up to their eyeballs. The Mattis and Pompeo Halloween duet was a freak show. They tried to talk like tough peacemakers. They told the Yemen War that it had 30 days to “get out of Dodge”. Mattis demanded that everybody had to sit around the peace table in Sweden. The way the US tells it, whoever the US enemy du jour is always refuses to talk peace. We just went through a similar farce about North Korea supposedly refusing to sit at the negotiation table. Actually, it is always the US that refuses to negotiate unless its demands of preconditions are met first. The US preconditions for Yemen is that it has to surrender. It has to stop resisting the US-led invasion. In return the US made the “generous” offer of not bombing civilian targets. Only then will the US be willing to dictate the terms. “Thirty days from now we want to see everybody around a peace table based on a ceasefire, based on a pullback from the border and then based on ceasing dropping of bombs (on civilian areas) that will permit the (UN) special envoy, Martin Griffiths — he’s very good, he knows what he’s doing — to get them together in Sweden and end this war.” Mattis should have added “Trick or Treat”. Surrender first is the US version of negotiating. The US is holding Yemeni civilians hostage. By offering to not bomb civilian targets, the US is admitting that it has been leading the Saudi bombing of civilians on purpose. The US-led Saudi coalition has dropped over 15,000 2000-pound bombs on Yemen. Yet for three years the UN has insisted that (only) 10,000 civilians have been killed. The actual number is in the tens of thousands, perhaps hundreds of thousands. The siege warfare and biological warfare of starvation and cholera have taking tens of thousands of lives as well. Most of those killed have been children. Someone should check with Madeleine Albright to find out if she thinks it has been “worth it”. She is another Halloween ghoul that thinks that killing children is a good thing. Yemen is another US dirty war. The US is using the same subterfuge and dirty tricks that it uses in Afghanistan, Iraq, Libya and Syria. The US and its co-conspirators Saudi Arabia and the other Gulf countries have been bombing Yemen and invading it with terrorist groups such as al Qaeda, Daesh and Blackwater mercenaries from South America. It is the US-led Saudi coalition that started the war. If Mattis and Pompeo want to end it all they must do is to stop bombing and attacking Yemen. Open the ports and let the humanitarian aid flow in. Stop funding Daesh and mercenaries in Yemen. It really would be that easy. Yemen is not attacking Saudi Arabia or anybody else. They are only firing their feeble rockets into Saudi Arabia in defiance. Here is some background on the war: See my article The US-Led Genocide and Destruction of Yemen. There was a popular uprising led by the Houthi Movement in 2011 that deposed the 33-year dictatorship of Ali Abdullah Saleh. The United Nations then facilitated negotiations for an interim government until national elections could be held. A nationwide referendum was held on the UN peace plan in 2012. Only one name was on the ballot for the interim president. It was the name of the US and the Kingdom of Saudi Arabia backed Abdrabbuh Mansour Hadi. Not surprisingly he got 100% of the votes cast. His term in office was 2 years. Instead of helping to form a unity government and prepare for elections in 2014, Hadi went on an International Monetary Fund imposed austerity program and a rapid privatization program. He went on a spree of an unauthorized massive sell off of state-owned enterprises at fire sale prices. The purchasers were outside Gulf States and US buyers. In 2014 Hadi illegally extended his presidency for another year, saying he needed more time. He increased the austerity program on Yemenis and intensified the privatizations. The people of Yemen said they had enough of Hadi. Under the leadership of the Northern group known as Houthis there were massive demonstrations in the capital city of Sana’a and demands for Hadi’s resignation. Hadi resigned and fled the capital city of Sana’a. He went to the Southern port city of Aden, rescinded his resignation, and tried to reconstitute his failed government. Failing that, he fled to Saudi Arabia. The US, Saudi Arabia, the UAE and the United Nations continue the hoax that Hadi is the “internationally recognized legitimate government” of Yemen. Based on that hoax, the US backs the Gulf Cooperation Council countries, which are led by Saudi Arabia and the UAE. The GCC formed a military coalition with US support to restore Hadi to power in Yemen by force. The US, which has been covertly involved in Yemen for decades, raised the issue that the US’s national security is threatened in Yemen. The US claim is that the Houthis have caused conditions for the growth of al Qaeda in the Arabian Peninsula (AQAP). How convenient that the US finds terrorists under every rock. It is the US that has been putting them there. 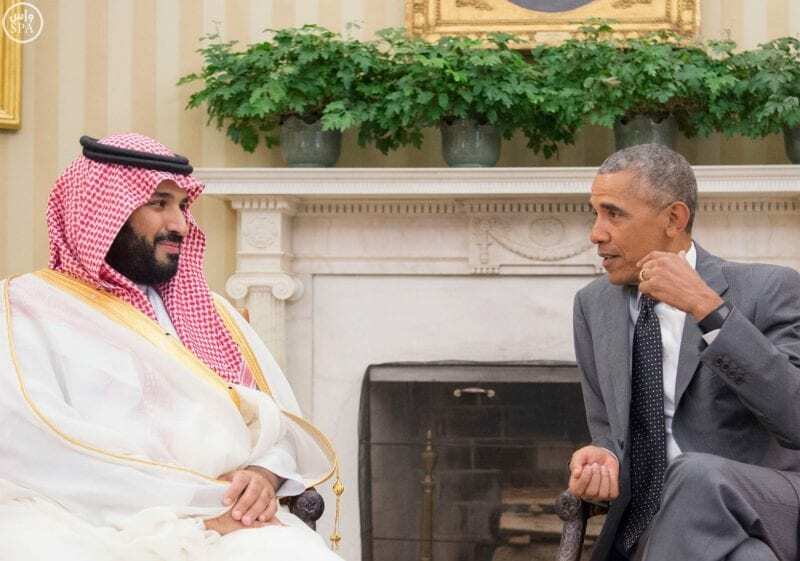 Obama with MBS in 2016. All US presidents must work to maintain the “special relationship” with the Saudi regime. The US’s real concern is that a new government in Yemen will not be compliant to Western neoliberalism and IMF imposed austerity and privatization. The Saudi’s are worried that a Houthi-led government in Yemen would not be under its oppressive thumb. 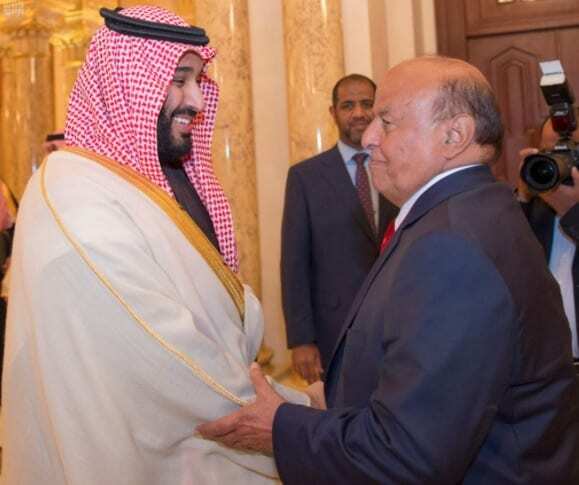 Together the UN, the US, the KSA and other Gulf Cooperation Council countries declared Hadi as the “internationally recognized legitimate government” of Yemen. Functioning out of a Riyadh five-star hotel, Hadi supposedly asked for the US-led Saudi coalition to aid him in restoring himself to power, in what he calls a civil war. Saudi Arabia and the UAE claim that they are coming to the aid of the “internationally recognized legitimate government” of Yemen. (Notice that the Western mainstream media always uses that exact phrasing to describe Hadi). The United Nations imposed a one-sided arms embargo on Yemen, which is actually a blockade. All of this happened with a wink, a node and a push from President Obama in 2015. With US logistical support, Saudi Arabia launched an air assault on Yemen in 2015 code named Operation Decisive Storm. When that failed the US-led Saudis appropriately renamed it Operation Restoring Hope. 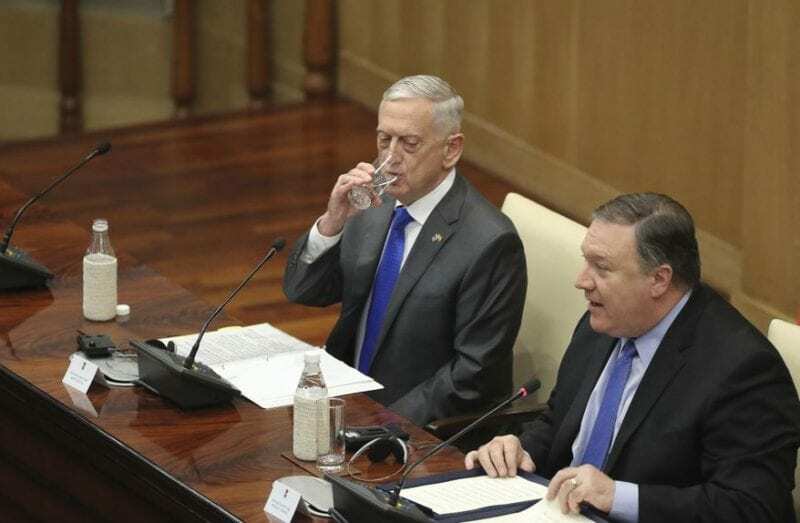 The US-led Saudis intensified their attacks on the civilian population, destroyed their water works and sanitation facilities, which has predictably caused an outbreak of cholera. The US-led Saudi coalition is a genocidal aggression. It has put 20 million people at grave risk of starvation and disease. Tens of thousands of Yemenis have died at the hands of the US, Saudi Arabia and the UAE. The people of Yemen do not have the 30 days that Mattis is taunting them with to begin a peace conference. In 30 days another 10,000 children or more will die of cholera, starvation and disease. If the US was sincere in wanting peace, which it shows no real desire for, then it would put a stop to the bombing within 24 hours. All the US would have to do is to stop supporting the Saudis. Stop refueling their planes, stop providing them with bombs, stop the US logistics and stop supporting Daesh and the mercenaries that the US, Saudi Arabia and the UAE have infiltrated into Yemen. A halt to the war would not put the US, Saudi Arabia or the other GCC countries at any risk. Yemen is not threatening to attack anyone. All Yemen wants is to be left alone. The blockade should be lifted immediately for humanitarian reasons. Lifting the blockade would allow desperately needed food, water, medical supplies and other essentials to enter the country. Lifting the blockade would save tens of thousands, maybe millions of lives. With the bombing stopped, terrorists subdued, and the blockade lifted, then humanitarian organizations such as Doctors Without Borders and the International Committee of the Red Cross could safely rush in to provide life-saving treatment for the thousands of dying children. Stopping the war in Yemen would not be complicated. It does not require a 30-day waiting period and months of negotiations by the UN’s “he’s very good, he knows what he is doing” Martin Griffiths. Mattis and Pompeo are not serious though. They are just toying with the millions of lives in Yemen. It was all a cruel Trick or Treat Halloween prank by “Mad Dog” Mattis and Pompeo.